Raw honey is honey that has NOT been heated, pasteurized or processed in any way. The differences between raw and pasteurized honey (the kind sold at most grocery stores) are huge. Raw honey is an alkaline-forming food that contains natural vitamins, enzymes, powerful antioxidants and other important natural nutrients. These nutrients are destroyed during the heating and pasteurization process. In terms of antioxidants, darker is better when it comes to honey. Processed honey is heated and filtered, robbing it on natural nutrients. Raw honey is extracted directly from the honeycomb. It is not heated, pasteurized or processed, which allows it to keep its vitamins, enzymes and other nutritional components. Because it is not processed, it has fine textured crystals, looks milkier, and contains particles of bee pollen and honeycomb bits which are essential to health. Raw honey has anti-viral, anti-bacterial, and anti-fungal properties. Raw honey has no shelf life, meaning that a jar of raw honey will last indefinitely on your shelf while retaining all of its beneficial properties. Raw honey tends to thicken and crystalize while sitting on a shelf. Should that happen, place the jar of honey in WARM water and it will liquify. Placing the raw honey in hot water will cause the honey to lose it’s beneficial properties. Raw honey has a cloudy appearance because of the pollen and other unfiltered material it contains, whereas processed honey is much clearer. Also, when you turn a bottle of honey upside down, processed honey will flow freely and raw honey will flow more slowly because it is more solid at room temperature. Labels on raw honey usually tell you that honey is unfiltered, unheated or unpasteurized. If none of these are mentioned, it might be processed honey. If you are unsure whether the honey is raw or processed, contact the maker of the honey. If the honey has been heated to above 120 degrees Fahrenheit, it is processed honey. Avoid. Warning — honey contains botulinum endospores, which are toxic to babies. Honey should not be given to children less than a year old. Manuka Honey — strong anti-bacterial properties and is used to treat a variety of conditions which include colds, sore throats, indigestion, stomach ulcers, and acne. Acacia Honey — cleanses the liver, promotes intestinal health, and reduces inflammation in the respiratory tract. Buckwheat Honey and Red Gum Honey — strong antioxidant properties. Eucalyptus Honey — prevents colds and headaches. Heather Honey — contains high levels of protein. Linden Honey — sedative and antiseptic properties. It is used to treat anxiety, insomnia, colds, coughs, and bronchitis. Neem Honey — treats high blood pressure, diabetes, skin conditions, periodontal infections, throat infections, and allergies. Immune System — contains 27 minerals, 22 amino acids, and 5,000 live enzymes to keep your immune system healthy and protect you from colds and flu. One daily spoonful is all that is needed to reap these benefits. Antioxidant Boost — significantly raises blood levels of antioxidants. Higher levels of antioxidants can ward off cancer-causing free radicals and keep your heart healthy. Wounds — antiseptic properties will clean wounds and inhibit bacterial growth. Its natural antibiotics and antibacterial properties aid in treating cuts and burns. It promotes healing, reduces swelling, deter scarring, and prevents infection. Raw honey contains glucose and fructose which strongly attract water. Because of this, honey can absorb the water in wounds, drying it out faster to discourage bacteria growth and promote faster healing. It also contains the enzyme glucose oxidase, when combined with water, produces hydrogen peroxide, which is a mild antiseptic. Skin Burns, Rashes, Abrasions — place a warm, moist cloth with honey over affected area. Acne — pimples are caused by bacteria, not by the foods you eat or drink. Raw honey is a topical antimicrobial agent for prevention and treatment of infections. Place a small amount on blemishes and acne nightly. Colds and Sore Throats — its antibiotic properties are effective in treating colds and sore throats. Raw honey also coats the throat and reduces irritation. Coughs — reduces the severity and frequency of nighttime cough from upper respiratory infection, and is more effective than cold medicines. In fact, over-the-counter cough and cold medicines should not be given to children under 6 years of age because they are generally ineffective and its potential side effects. Take 1-2 tablespoons of raw honey at bedtime, preferably buckwheat honey. Blocked Sinuses — mix a teaspoon of honey in a pot of hot water, put a towel over your head, and inhale the steam. Allergies — raw, local honey is preferred for treating allergies because the likelihood is great that it will contain small amounts of the specific pollens an individual may be allergic to. Take a teaspoon of raw honey a couple of times a day starting a few months prior to allergy season. Calories and Weight Loss — contains less calories than table sugar, plus our body tolerates honey better than table sugar. Cholesterol — reduces total cholesterol, triglycerides, and blood-sugar levels. Raw honey also increases HDL, the good cholesterol. Diabetes — less likely to cause blood sugar spike. Raw honey also causes blood-sugar levels to rise less than table sugar, which may help to improve blood-sugar control and insulin resistance. Stomach and Digestive Health — raw honey is easy to digest because the sugars in honey are easily converted into glucose. The enzymes in honey help the body to digest raw sugar starch. Honey can inhibit the growth of the kind of bacteria that causes gastric ulcers. Because of the thickness and coating ability of honey, it can be used as a laxative. Honey combined with apple cider vinegar (organic, unfiltered) can be used to treat stomachaches and constipation. Honey with cinnamon is used to stomachaches and bladder infections. Honey also relieves morning sickness in pregnant women. Weight Loss — contains vitamins and minerals. Because refined sugars do not contain vitamins or mineral, the body must utilize its store of valuable nutrients to digest refined sugar. This process depletes the supply of minerals essential to dissolve cholesterol and fats. Raw honey helps metabolize cholesterol and fatty acid preventing obesity. 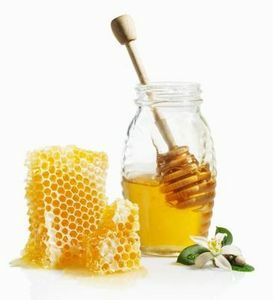 Facial Mask, Hair Conditioner, Skin Moisturizer — using honey as a facial mask will exfoliate, clarify, and unclog pores. Raw honey can be used as a deep conditioning treatment for dry hair because the sugars in honey attract water to restore moisture in your hair. After shampooing, smooth honey through your hair from root to tip. Rinse it out completely. Workout Energizer — an efficient energy source. Raw honey helps produce favorable blood-sugar levels before, during, and after workouts, which maintains muscle stores and provides for a faster recovery after workouts. This entry was posted in Bees and Honey. Bookmark the permalink.